Munich Re Digital Partners (MRDP) hosted an insurance technology companies (insurtech) seminar to promote understanding and collaboration. As a start-up with MRDP support TSFL was there and ‘pitching’. Andy Rear, Chief Executive MRDP, provided an insightful start and was followed by a panel discussion with MRDP, Insurtech, VC and Regulatory representatives discussing pertinent issues facing Insurtech. The selected Insurtech start-ups then pitching. The event also showcased various participants operating within the Insurtech ecosystem, including our insurance development partners Ambant Underwriting Services. 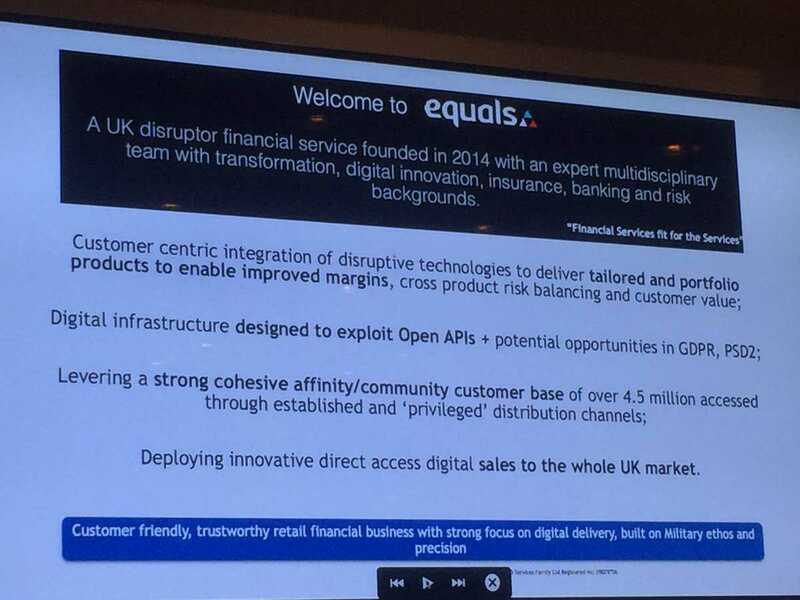 Andy Rear, Tweeted "Equals; bringing military precision to financial services for the military"
NB: Not just the military but The Services Family and all those that share our values! Aside the often tortuous product selection, application, T&Cs understanding and its yearly cycle, the key threats are a race-to-the-bottom in cost driven cover, legacy systems, legacy practices, failure to develop trust with customers and often a disappointing claims handling process from the customer perspective. In the business big rewards/opportunities for automation and de-layering of the distribution chain. What's not to like? - if you're a disruptor! Very happy that our analysis of the industry and opportunities has been reinforced - again. Great event, thank you Jenny Yeung-Williams @MunichRe and well done the MRDP team.